1. Yep – I am a self help junkie – I love to learn, love to experiment. 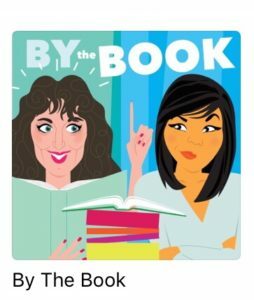 No surprise then, that the By the Book Podcast with comedian Jolenta Greenberg and her sceptical friend Kristen Meinzer delights me. Each week the friends talk about their experience of living the rules of a self help book – often with considerable irreverence along with helpful tips. 2. A quote I am sitting with “wonder is the precondition for all wisdom”. Christian Wiman. 3. One of my favourite summer reads is Chitra Divakaruni’s most recent and acclaimed novel, Before We Visit the Goddess, about the deep and complicated bond between mothers and daughters, across generations and continents. 4. I love my coffee and my mugs. I have a few favourite cups that light up my day. 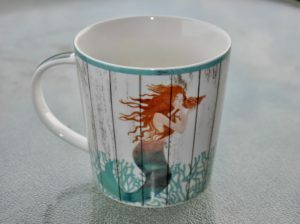 This morning it was the mermaid cup – but it is not just the cup I like – it’s the story. The cup is part of a collection from Two Can Art, a collaborative collection between artist Patti Gay and her son Noah, who is autistic. 5. In case you missed our recent Women in Leadership for Life Facebook post, July 24 was International Self Care Day. The International Self Care Foundation’s vision is a world in which people live long healthy lives, by taking personal responsibility for their own wellness, by adopting a healthy lifestyle and self-care behaviours. Lots of resources on 7 ways to help with your self care. Sign up for our newsletter to get inspiring articles, news about workshops and events, and a copy of our ebook, “13 Practices for Brilliant Women: A guide for transforming intentions into action.” We hope you’ll follow us on Facebook to see what is going on in the Women in Leadership for Life world.